This page explains the various features of the CDX series through easy-to-understand videos. Each video uses actual workpieces to demonstrate the strengths of the sensors. This demonstration highlights deflection measurement with high-speed hard disk drives. With excessive deflection, the hard disk drive platter will come into contact with the magnetic head, causing problems such as physical damage to the drive and read errors. With a sampling period of just 12.5 μs, the CDX series ensures stable measurement of hard disk drive deflection. This demonstration shows the CDX series measuring smartphone glass thickness. Uneven glass thickness or warpage results in gaps forming, causing quality defects. With a resolution of 0.25 μm, the CDX-L15A / -LW15A enables high-accuracy measurement of various glass thicknesses. This demonstration shows the CDX series measuring the shape of a cam shaft with both a black matte surface and a mirror-like surface such as metal. Conventional laser displacement sensors are incapable of handling sudden changes in the receiving light level, such as due to color changes, resulting in a measurement delay. The CDX series, however, includes a newly developed image sensor that enables stable measurement with no delay. This demonstration illustrates shape measurement of a fan rotating at 3000 rpm. Whereas contact-type sensors are incapable of measuring moving workpieces such as fans, the CDX series utilizes non-contact measurement. In addition, the 12.5 μs sampling period means measurement is performed without delays. • World’s No. 1 Linearity：±0.015％F.S. 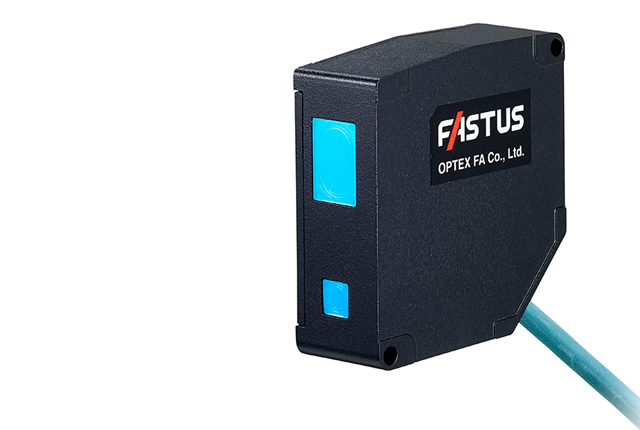 Featuring a fusion of ultra high-accuracy and ease-of-use, these laser displacement sensors feature an extremely high level of perfection. FASTUS TV offers a wide variety of product videos. Technical videos, exhibition featurettes, and other videos are also available, so tune in today!